There are many school bands and wind instrument bands not just from high schools in Hawaii, but also from the U.S. mainland at the 14th Annual Honolulu Festival. Up until now, the participating groups from Japan were most noticeable at the Honolulu Festival. But recently, there has been an increase in the number of school bands from the U.S. mainland. The majority of those students from the mainland were first time visiting Hawaii in which they were very excited even before they arrived. They are performing in some of their local parades but they seemed nervous because this was their first time to perform in Hawaii. More in all, they were filled with hope and joy because they get to see the blue sky as well as the blue sea of Hawaii and also experience different cultures in person. 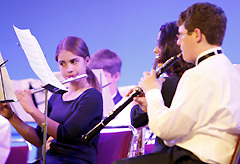 The Symphonic Band from Lake Highland Preparatory School is comprised of students in 7th through 12 grade. Also, the choir consisted of 9th through 12th grade also joined the band to participate at the Honolulu Festival. They sang beautifully and clearly while the Symphonic Band played the music. Also, the Symphonic Band performed on the Royal Caribbean cruise ship as well in the NYC St. Patrick’s Day Parade. They are highly praised in various concerts and marching competitions both locally and all over the U.S. Furthermore, the group of choir is led by Bettie Ann Candelora. They do tours in New York, Chicago, Bahama and others. On December 2007, they participated as the Candlelight Professional in Epcot at Walk Disney World. In addition, they are performing at the Dolly Parton’s Dixie Stampede every year. Also, they are planning to perform for various community service projects such Ronald McDonald House Charities. Potomac Falls High School is located in Sterling, Virginia which is a suburb of Washington D.C. Their band programs include symphony, concert band, jazz, flute, marching band and indoor drumline. Also, the band is performing solo and small ensembles. This school is also known for their marching band which is relatively new. Despite of it, they have already won 150 awards. Also, the band has earned the title of “Virginia Honor Band” for 7 times at both the State Marching Band Festival and the District Concert Band Festival. The Toby Johnson Middle School Jaguar Marching Band and Color Guard are from Elk Grove, California. The band members are all 8th graders led by Jay Roberts, who is the director and they have been active for 2 years. Also they won various competitions around North California in 2008. We are waiting for lots of various performers including school bands, brass bands and cheerleaders to participate at the Honolulu Festival. See you all at the Honolulu Festival!